*I removed Rashan Gary today after he announced he would enter the 2019 NFL Draft. Kind of surprised you don’t see Jordan Anthony at SAM or Ambry Thomas replacing whichever of the CBs decide to enter the draft. Any chance Mayfield gets the nod over Steuber at RT while he waits for Runyan to graduate or is he needed for the LT depth? While I could see Black rise back up, I would be surprised if Bell leap-frogged over Collins. I like what Collins did this year and I think he’ll stick as a starter. If M is smart they’ll lean a lot more on the DPJ/Black/Collins trio and a lot less on McKeon/Gentry next year. I don’t think Bell would leapfrog over Collins, either. Bell is listed as the 3rd WR. It won’t matter who they lean on if they are afraid to use their passing game. And we are still seriously lacking speed and big play capability all over the offense. Will be trouble if they lose both Long and Hill to the NFL. Hoping to keep one and slide Thomas in as starter with a competition open for #3 CB. Metellus was the one guy this year IMO who REALLY played above his expectations. Kinnell was a good player but there should be an athleticism upgrade in his spot with either Hawkins or Hill, though Woods may reassert himself into the mix too. I’m not convinced we will be in trouble if Long and Hill leave. Not to diminish them, but Mike Zordich has turned every cornerback into a player who’s at or near the top of the conference (Lewis, Stribling, Clark, Long, Hill, Watson). There’s no evidence suggesting he can’t/won’t do the same with Spider Sims, Ambry Thomas, Jalen Perry, or whoever else gets inserted at cornerback. Good point. I guess the question is if Hill/Long stepping in seamlessly can be repeated with Thomas/Sims and whoever else. Zordich probably has earned the benefit of the doubt. Metellus and Kinnel were two of our biggest weaknesses on defense all year, and opposing teams picked on them a lot. Unless we get faster, more athletic safeties with better coverage skills (along with much better DTs), this will never be a championship level defense. Yeah, Metellus was beaten a couple times (so were Winovich, Kinnel, Hill, Long, etc. ), but he usually corrected his mistakes. I thought he improved significantly from 2017 to 2018. Last year the weak spot on the defense was the safety position. This year it was the defensive tackles. Nobody was picking on Long and Hill this year. Long split snaps with Watson all year – that’s the guy who got worked by OSU time and time again. That’s the matchup they wanted to exploit, not Metellus or Kinnel. Watson’s backup is a top 100 recruit. Brown made the call to go with Watson this year and some people claimed that Watson was M’s best CB during the year. They were wrong about that. Hill was good for about one pass interference a game. And Wisconsin, for one, picked on Hill. Agree on DT’s. Solomon was cursed this year. They really missed him. He has to be the starter next year. Kemp will be solid but not much of a pass rusher. Dwumfour really needs to progress he is below average against the run right now. Any camp buzz on Jeter or other DT’s? Any chance Solomon leaves? Solomon and Dwumfour are on track career-wise to be all-conference caliber players. DT play should be better next year if those 2 improve as you’d expect. Hope that Kemp, Jeter, Hinton and others can step up to replace Mone/Marshall snaps. Not too big of an ask. Pretty much everyone who completed the ball over the middle against us did it against Kinnel or Metellus. It happened game after game after game. Completion over the middle and it was a pretty sure bet that either 14 or 23 would be getting there late. I think it was/is a top 5 defense but nobody is bullet-proof. I would put the weakness in defending short-passing game on scheme (Brown) more than personnel this week. Well, there’s not bullet- proof, and then there’s Sonny at the toll booth. When it mattered, we were the latter. Ha. Well, yes but blaming this on Metellus seems like criticizing the fuel-efficiency on Sonny’s car. When Brown gets beat, he gets beat big (FSU ’16, PSU ’17, and OSU ’18). Include the 1st Q against ND if you like, but those are the 3 big games where Brown got outcoached and only FSU was really defensible (losing Peppers the day before). Not putting all the blame on Metellus, but just pointing out that he is one of the weak points on this defense, and in this day and age, high quality offenses will exploit any hole you give them. And frankly, a really good offense these days can be tough to stop, no matter how good your defense is. Which is why you can’t win championships these days with a good defense and a “reliable” offense with a game manager at QB. No matter how good your defense is, sometimes you have to outscore people. Harbaugh hasn’t tumbled to that yet. I don’t really even think Metellus was a weak point on the defense. I was hard on him last year when he WAS mediocre/bad, but he improved a lot this year with his understanding of the game. Don’t think Metellus was a weak spot. He’s playing like an NFL draft pick. He’s a big reason why the D was excellent all year (until OSU) and he wasn’t why they struggled last week. I’d rather have a ‘scoring offense’ than a ‘ball control offense’ but that’s less important to me than having some identity and not just trying to run the same stuff everyone else runs. I’m optimistic that Michigan can establish that identity as the OL matures. Michigan’s shown it can have a top 25-35 offense but I’d like to see them get to top 15 next year. So, with D Bush almost assuredly gone to the league, I can’t see Charles Thomas or Amauri Peseck-Hickson starting from day 1. Is it safe to assume that some of that talent logjam at the WILL can slide over to fill the void at MIKE? Who’s measurables best fit the mold? Yes. Personally, I think Josh Ross would/should slide over to MIKE. We haven’t seen Cam McGrone play in college yet, but I do think he has the measureables to fill the role of a sideline-to-sideline Devin Bush type of player. Thanks. Ross is kind of who I was thinking of as well. He has that sideline to sideline speed and ability to finish off tackles that made Bush such an incredible asset. Feels like I could have been more consistent in approach by grouping the FBs with RBs. Consider the history of flexing between RB/FB with guys like Mason, Hill, and Houma and the position’s apparent de-emphasis (1 start on the year for Mason) in favor of 2TE (observed) and multi-WR (roster-based speculation) sets. Still big decisions coming for Hudson, Metellus, Long, Hill and others. But at this moment I see reason to expect another Top 10 team +/- 5 depending on how things break. QB & WR — deep with NFL-caliber talent and experience, plus some speedy slot options coming in. Interior OL — 3 returning all-conference starters who project to the NFL. The depth talent and stability is a luxury Michigan hasn’t had in years. Secondary — NFL decisions loom, but potential to get back 4 of 5 starters. They will all be seniors playing in the system they know. With guys like A.Thomas and D.Hill waiting in the wings the secondary would probably still be excellent with a departure at CB or S but losing Hudson would be a big blow. Pass Rush — Paye and Uche are dangerous. Dwumfour has flashed too. Brown will blitz a ton if he has a lock-down secondary. OT — Runyan projects to be legitimately good in 2019 but Mr. Didnt-beat-out-JBB may continue the recent tradition of relatively weak play from tackle. DT — Kemp, Dwumfour, and Jeter have pedigree but experience and depth are big questions. Expect position shuffling to reinforce and freshman to play a role. Can Mattison deliver again? 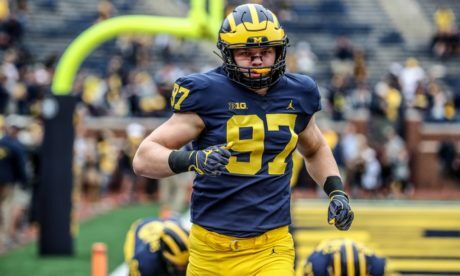 Run Defense — with questions on the DL and the possibility of mediocre LB play without Bush, Michigan may struggle like they haven’t in years to defend the run. Jeter is drawing tons of praise but if he doesn’t pan out Michigan will be undersized up front. Things look typically fine, stable, good, acceptable, deep but probably unexceptional at RB, TE, LB and special teams. Losing Hudson might be OK but will probably mean moving Metellus, Hawkins, or Woods. I think Michigan is fine losing 1 of the corners and 1 of Metellus/Hudson. Losing 2 of either would be a big challenge. Update: the departures and disappointing bowl performance have caused me to increment expectations a bit downward. Top 15 seems a lot more likely than Top 5 at the moment. However, I still think there is upside to get there if the OL develops as hoped and the coaching staff makes positive improvements.